This summer two members of the Miss Nagasaki Homecoming Committee invited me to visit Nagasaki Prefecture's two remaining Blue-eyed Dolls, one at Shimabara Daiichi Elementary School and the other at Hirado Kindergarten. Only two years ago it was discovered that the Japanese Ambassador Doll at the Rochester Museum & Science Center is actually Miss Nagasaki, even though for many years the doll was thought to be Miss Aomori. 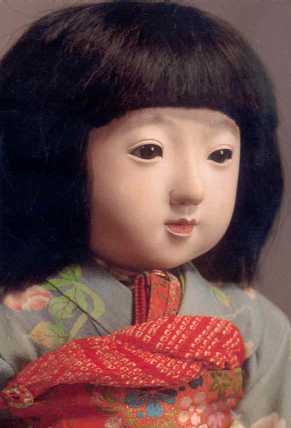 Since the time of the discovery, many people in Nagasaki Prefecture have been working actively to bring about a homecoming for Miss Nagasaki, one of the 58 Friendship Dolls sent from Japan in 1927 as a gift to the children of America. The citizens of Nagasaki Prefecture are anxiously waiting for the exhibition of Miss Nagasaki from February to April 2003 in the cities of Nagasaki, Sasebo, Hirado, and Shimabara. Many employees of the Nagasaki Shimbun, the leading newspaper in Nagasaki Prefecture, are active members of the Miss Nagasaki Homecoming Committee. The newspaper has provided the Committee with office space to work on the homecoming activities. I contacted the Nagasaki Shimbun earlier this year about translating a series of articles about Miss Nagasaki and the Friendship Dolls. Mr. Hirobumi Toyama, a retired high school English teacher, and Ms. Shoko Yamashita, a reporter at the Nagasaki Shimbun, extended an invitation to me to visit Nagasaki. They also kindly sent me a huge package of articles published by the Nagasaki Shimbun and other materials about the Friendship Dolls in Nagasaki Prefecture. The beautiful coastal city of Shimabara was my first stop in Nagasaki Prefecture. On Sunday evening there was a meeting about the Friendship Dolls at a community center, and Mr. Toyama gave a long talk about the history of Miss Nagasaki and the Friendship Dolls. I also talked about some my activities related to the Friendship Dolls. This meeting was the kickoff of activities in Shimabara to get ready for the exhibition of Miss Nagasaki from April 3 to 8, 2003. Afterwards, I went with about ten members of the Committee to eat some local delicacies at a nearby restaurant. Some Committee members also accompanied me on my visit to Shimabara Daiichi Elementary School on Monday morning, and a friendly couple showed Mr. Toyama and me several sites of Shimabara after our visit to the school. On Monday afternoon I traveled to the island of Hirado to visit Hirado Kindergarten on Tuesday. On Tuesday evening there was a party with the Homecoming Committee at a restaurant in Nagasaki City, so I left Hirado in the early afternoon. However, I ended up on a train that stops at every station, and I also got lost in the 3-block walk from Nagasaki Station to my hotel, so I finally arrived at the party about an hour late after everyone had started to eat. Even though I had never met Shoko Yamashita, I recognized her because she appeared on a Friendship Doll video that was shown to me when I visited Hirado Kindergarten. 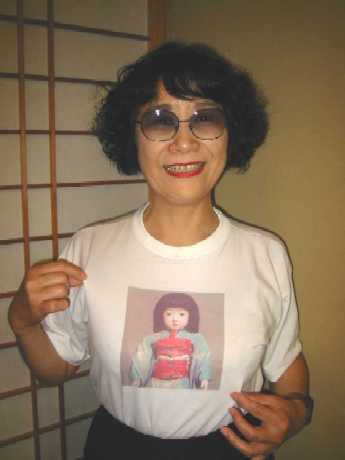 She came to the party dressed in a T-shirt with Miss Nagasaki on front. The food at the party was delicious, but I could not believe how much was brought out. I was not the only person not able to finish the food brought for me, so many people made use of "doggy bags" (a term everyone seemed familiar with even though there is no specific word in Japanese for this). The Miss Nagasaki Homecoming Committee gave me several items related to the homecoming, including two sets of five postcards, which consist of photos of Miss Nagasaki (2), the Blue-eyed Doll Ellen at Hirado Kindergarten, the Blue-eyed Doll Little Mary at Shimabara Daiichi Elementary School, and the Rochester Museum & Science Center where Miss Nagasaki is kept. These special post cards are being sold at the post office and other places in order to raise money to cover the expenses related to the shipment of Miss Nagasaki from the U.S. and the exhibition of the doll in four cities in Nagasaki Prefecture. They also gave me a couple of note pads with Miss Nagasaki's photo on each page, a poster advertising Miss Nagasaki's homecoming, and copies of 25 Friendship Doll articles published by the Nagasaki Shimbun from July 4 to August 25, 2000. Mr. Toyama has been my main contact with the Miss Nagasaki Homecoming Committee since I sent my first letter to the Nagasaki Shimbun in May of this year. He loves to write haiku, which is a Japanese poem consisting of 17 syllables divided into 3 lines of 5, 7, and 5 syllables. This spring, he visited Rochester, New York, where Miss Nagasaki is stored at the Rochester Museum & Science Center. As part of his trip, he composed some haiku in English. He says in order to write good haiku in Japanese you need to know many words from nature, so he asked me what Americans call the top part of an acorn. He said the dictionary indicated it is called a "calyx" or "husk." I assured him that few English speakers would appreciate the poetic beauty of the word "calyx," and most Americans (including me) would have no idea what he is talking about. I finally decided the best word may just be "acorn top." Mr. Toyama has written many articles about the Friendship Dolls, and he edited a children's book entitled Little Mary -- The Blue-eyed Doll--, which has been used as supplemental material for Japanese high school students studying English. Earlier this year he sent me a very interesting book entitled Stories of Nagasaki, which he helped to edit. This book has about 50 vignettes from the history of Nagasaki, including the story of the Friendship Dolls sent to Japan in 1927. Many people in Nagasaki Prefecture extended their kind hospitality to me during my stay, and I wish I could mention all of them by name. One of the Homecoming Committee leaders in Shimabara gave me a surprising gift, which was a booklet about the Friendship Dolls at Matsuyama Elementary School in faraway Yamagata Prefecture. The reason it was such a surprise was that Mr. Yuji Suzuki, a leader of the Yamagata Blue-eyed Doll Association who I met last year during my visit to Yamagata City Daiju Elementary School, had earlier this year sent me a newspaper article about the dolls at the same school. I had translated the article about the dolls to publish on my Friendship Dolls web site. I also want to mention the special support extended by many employees of the Nagasaki Shimbun, who I met in each of the four cities where Miss Nagasaki will be displayed next year. The most surprising meeting was in Sasebo, where I went from the train station to the bus station in order to take a bus to Hirado. The Manager of the Sasebo Branch of the Nagasaki Shimbun accompanied me between the stations, and we had a very pleasant chat during the half hour or so I waited for the bus. Ms. Yamashita and a volunteer worker from the newspaper really surprised me at the Nagasaki train station on Wednesday morning when I was leaving Nagasaki to go to Yamaguchi Prefecture. I went into a store to buy a box lunch to eat on the train, and when I came out they were standing next to my luggage. I was a little embarrassed that they recognized I was nearby by the huge size of my suitcase on the sidewalk.